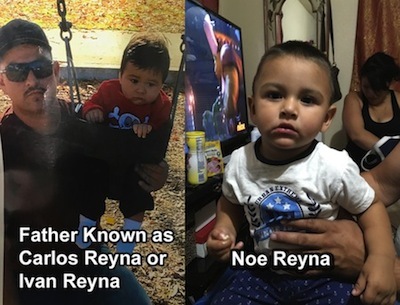 Authorities asked the public Wednesday to be on the lookout for a 15-month-old boy allegedly abducted in Boyle Heights by his father. The California Highway Patrol issued an Amber Alert for Noe early Wednesday morning for Los Angeles, Orange and San Diego counties. A court issued an order Tuesday for the Department of Children Family Services to take Noe into protective custody, police said. Both parents were in court and were notified of the court order. Reyna fled with Noe without taking diapers or formula, police said. A Hollenbeck Division officer added that police “feel” the baby is not in danger. 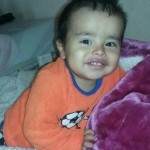 Noe is Latino, 2 feet tall, about 35 pounds, with black hair and brown eyes. He was last seen wearing a yellow shirt, black shorts with two green stripes and black tennis shoes. Reyna is Latino, 6 feet 2 and 200 pounds, authorities said. He is believed to be wearing a white T-shirt, blue jeans, brown boots and is using a red stroller. Noe’s mother is cooperating with authorities, police said. Bloodhounds are aiding in the search for the boy, according to reports from the kidnapping scene. Anyone who sees Noe or Carlos Reyna or has information regarding their whereabouts is urged to call 911. Updated 11/16/17 to include information that police now believe the father and son are in Mexico. A search was underway Thursday for a man who kidnapped a year-old boy from a recycling center, although the infant later turned up unharmed. Caleb Castro and his two sisters, ages 4 and 6, were in a red Honda Odyssey parked at SA Recycling at 1545 Gage Road when a man ordered the two girls out Thursday afternoon and drove away with the boy still inside, according to Montebello police. “The mother screamed that her baby was in the car,” a police statement said, adding that the man nonetheless drove the vehicle out of the parking lot and southbound on Gage Road. An Amber Alert was issued, and someone reported just before 7 p.m. Thursday that the van was parked in the rear of a McDonald’s parking lot at 9333 W. Slauson Ave. in Pico Rivera, according to Montebello police. Police found the minivan with Caleb inside and reunited the boy with his mother, said Montebello Police Capt. Luis Lopez. The boy appeared unharmed but was taken to a local hospital to be examined, police said. The Spanish-speaking suspect was described as Hispanic, about 30 years old, with spiked hair. He remains at large. Outside the hospital where the boy was examined, the child’s relieved mother, Maria Castro, told reporters she feels blessed that Caleb was not harmed. “I just say thanks to him that he left the baby OK and he didn’t do anything to him,” she said of the kidnapper. Holding her baby in her arms as she spoke, Castro said she had erred in leaving the keys in the vehicle with her kids inside but asked that people refrain from judging her. “We all make mistakes in different ways,” she said. A man allegedly kidnapped his 2-year-old biological son today in Boyle Heights and drove off in the child’s mother’s vehicle, police said. Abraham Vargas, 27, is believed driving an Orange Nissan Quest, license number 7CIN189. The car has tinted windows, with damage on the driver’s said Los Angeles Police Officer Norma Eisenman. The child’s mother—Vargas’s former girlfriend—had obtained a restraining order against him, Eisenman said. The crime occurred about 6:30 a.m. in the 1000 block of Lorena Street, Eisenman said. Vargas is Hispanic and weighs about 180 pounds. He was wearing a red sweatshirt and blue jeans. His son, identified as Edwin Vargas, is Hispanic, and was wearing a red sweatshirt and blue sweat pants. Anyone seeing them was urged to call 911, Eisenman said.